Lyra 2011 - Commercial Printing, InkJets and Managed Print Services. "Secular Decrease"
The Lyra 2011 symposium was held last week in Palm Springs. This was my third trip to the symposium, I must like it. The staff always present complex data, financial reflections of our industry in a easy to understand manner. 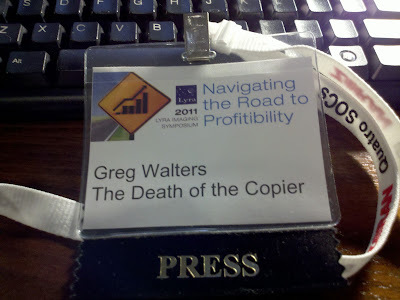 This year, Navigating the Road to Profitability, was not a disappointment. Of particular interest to me is the yearly presentation by Lyra analysts, Ann Priede and Charles LeCompte - Copier Vendor Scorecard. This analysis of course, is focused on our industry but the overall global, economic influences are apparent. I do not know if I can do the folks at Lyra credit, trying to explain the findings of their study, but here it goes. It is generally excepted that Q4/2007, was the peak for revenues and Operating Earnings for the 10-11 companies report copier based financial information. In Q4/2007 industry revenues reached just over $35B with Operating Earnings(OE)around $3.5B. This is the base comparison called "Peak". Q1/2009 is the low point with industry revenues just over $25B and OE down around $1.0B - this is called the "trough". The Peak to Trough OE downturn is - 65.0%. This means that at its worst, the industry's OE was down 65% as compared to its best, in Q4/2007. Lyra measured all performance against the Peak as companies climb out of the Trough. This analysis followed years 2007 to Q3/2010. First, comparing today's levels of OE to the lowest in Q1/2009, there is a 107% increase. Meaning companies are starting to climb out of the hole/trough. Not bad. Until you look deeper. OE rose from a low of nearly $1B in Q1/2009 to a current level of $2.5B. Yet this 2.5B is -27% when compared to the Peak of $3.5B in Q4/2007. This means that even with a 107% increase in OE from Q1/2009 to today, we are still below the Q4/2007 figures by 27%. Another interesting point; our OE slide from of $3.5B(Peak) in Q4/2007 to $1B in Q1/2009(Trough) took only 5 quarters. Its been 6 Quarters since the Trough, and we are still -27%. We have been -27%, for Q4/2010, Q1, Q2 and Q3/2010. A slow "recovery". From Q4/2009 to Q3/2010, OE has been flat at just over $2.5B - that's four quarters of sustained, -27% levels. Could this be the new normal? How does MPS fit into this? Well, MPS has gained ground over the past 4 quarters. Could the MPS move be stealing some of the wind out of those awful big copier manufacturer sails? It was suggested, many times, the impact of MPS is eroding copier placements. Managed Print Services came up in all sort of discussion topics, some seemingly unrelated to MPS. But we know better don't we? There is no such thing as a topic in the imaging industry, "unrelated" to MPS. Another phrase that popped up was, "Secular Decrease" - yikes. 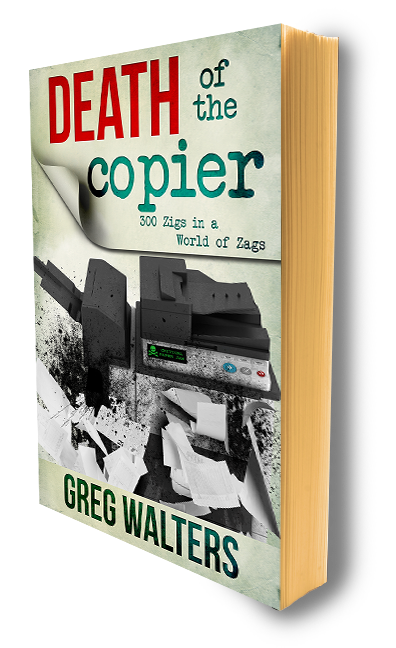 My suggestion - the war between copiers and printers/MFP's is over, and copiers lost. Its right there on the wall.